The folks over at NetherRealm haven’t been taking a well-deserved vacation since the launch of Injustice 2. On the contrary, in fact, as Ed Boon and the rest of the development team appear to have been hard at work on cooking up several new DLC characters for the superpowered beat ’em up. As per the title’s latest update, which introduced a range of bug fixes and the like, a new character select screen was briefly introduced (and later pulled), which features a series of empty character slots. Fortunately, a Reddit user managed to take a picture of the screen before it disappeared, a higher quality version of which you can find below (via ComicBook). Not all of the silhouettes immediately give away who it is that’s hiding behind the shadow, but we can make some pretty good guesses as to who some of them are. Mortal Kombat fans should immediately recognize one particular greyed out slot, which shows what appears to be thunder god Raiden sporting his iconic hat. Likewise, on the other side, the oval-shaped head of another contender strongly hints towards the inclusion of Black Manta. The Atom also appears to be a strong favorite to fill the leftmost slot in the top row, given his ability to manipulate size. 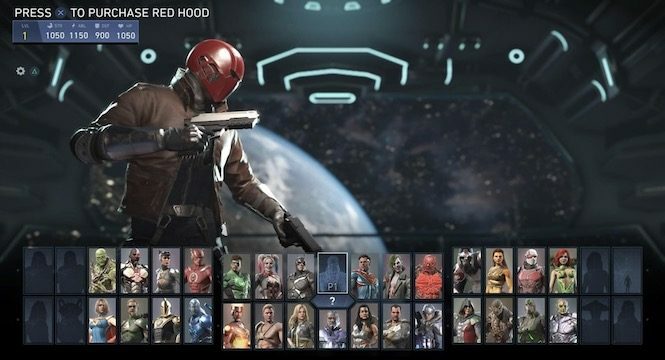 Of course, none of this is official until NetherRealm says so, but just by the above alone, it looks as if many of Injustice 2‘s DLC characters have already been outed. We’ll have to wait and see whether the studio has anything more to show at E3 next week, but there’s already plenty of new faces that have been confirmed. Red Hood, Starfire and Sub-Zero are all coming before the end of June and you can see here for all the details.